When I set out to know Neo4j better, I couldn't easily find something which would get me started with Neo4j. Most articles and videos talked about theory or assumed you already knew the basics, and the examples were in Java; I couldn't find a straightforward tutorial which would show a non-Java guy how to start interacting with Neo4j. This tutorial is not meant to be an in-depth tutorial on Neo4j or graph databases. The intention of this introductory tutorial is to point you at the right directions on getting started with Neo4j. Neo4j is a graph database. Graph databases are a database system which is composed of nodes (vertices) and relationships (edges) instead of tables, which is a completely different paradigm from SQL. That's all I would say at this stage. Once you start interacting with the database, you will have a better understanding of how Neo4j and graph databases work. In the meantime let me link you to Graph Database entry on Wikipedia and an explanation here. The Neo4j manual is located in the doc directory. I would recommend checking out doc/manual/pdf/neo4j-manual.pdf (PDF version of the manual) and doc/manual/html/index.html (HTML version of the manual). And it is in the bin directort you will find the Neo4j server and shell executables, along with other things. As simple as that. If you are planning on installing Neo4j as a service, refer this. Now that you have Neo4j running, let's find out how to interact with it. The command line Neo4j shell is located at bin/bin/neo4j-shell, using which you can browse around the database (much like browsing through a file system!). Along with that, Neo4j provides an amazing web admin panel at http://localhost:7474/webadmin/ (make sure Neo4j is running to access the panel). The admin panel, among other things, provides THREE different types of consoles to interact with your data - the standard Neo4j Shell, Gremlin, and HTTP. Neo4j Shell and Gremlin is best used for manual interaction with the data, and the HTTP shell is best used to see how your apps might interact with the Neo4j REST API. 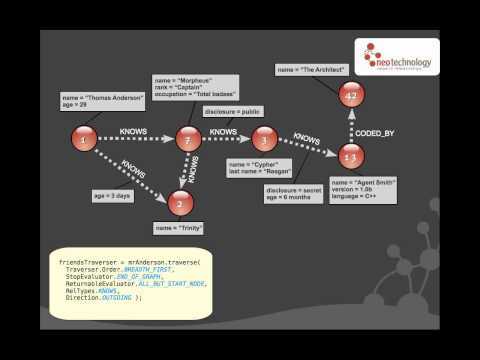 Here is an example session of Neo4j interaction from the shell. The ideal approach of familiarizing oneself with how Neo4j works would be via the Neo4j shell. Unfortunately, as hard as I tried, I couldn't find a way to create independent nodes using the Neo4j shell, which makes no sense to me at all. You have rmnode and rmrel to delete nodes and relationships respectively, but apparently you use mkrel to create both nodes and relationships! I hope a more sensible way of creating nodes and relationships is introduced later. Querying the database from the Neo4j shell is done using the Cypher query language. Details about the language can be found at http://docs.neo4j.org/chunked/1.6.M02/cypher-query-lang.html. Neo4j supports two types of indexes - node indexes and relationship indexes. Node indexes are used for searching nodes, and relationship indexes are used for searching relationships. Details about indexes in Neo4j can be found at http://docs.neo4j.org/chunked/snapshot/indexing.html. As I mentioned at the beginning, this tutorial is not meant to be a detailed Neo4j tutorial, it is supposed to be more like a resource pointer to help oriented newbies to Neo4j. I actually started writing this tutorial with the intention of making it a one stop Neo4j tutorial page, but figured mid way that the topic is too vast and I would end up with a HUGEEEEE one-page tutorial which would only tire my readers. So I decided I would rather create a series of Neo4j tutorials, which starts with this one. I will be covering important aspects of Neo4j one by one in the coming days with excellent examples and explanation. Stay tuned. Thanks for sharing! That’s very helpful. Thanks, I wish I stumbled across this earlier. Would have saved me a lot of time and effort it took me to configure Neo4j on Linux. Please also modify to address the issue of requiring the Sun JDK for installing to replace the relevant lines on the installation config file.